Really the ultimate barcode reader - much like the handheld scanners you see at retail checkouts. It has rechargeable batteries - so charge before use, then you can put the lead away. 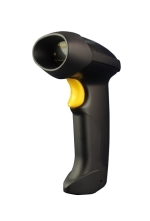 Unlike the other scanners - where you have to virtually be touching the barcode for the scanner to read - the laser scanner allows you to point at the barcode up to a range of about 13 inches. This makes it faster and definitely easier to use when actually scanning barcoded wine tags or wine UPC barcodes on the bottle. The bar code wizard in The Uncorked Cellar allows you to add wines using the UPC code on the bottle, or a barcode printed on the wine inventory tag. Those who are already using barcode readers are raving as to the increased efficiency of entering and removing wine.